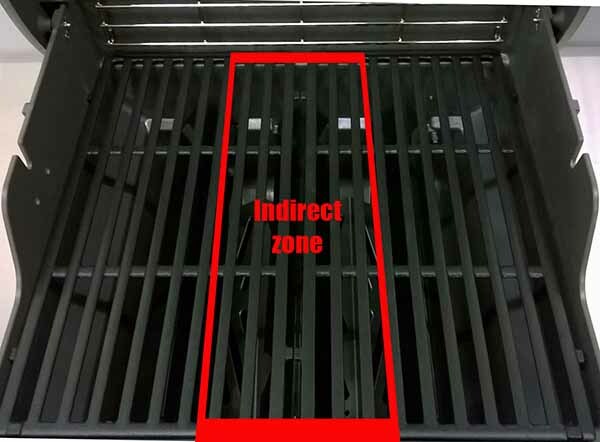 Many grill owners are familiar with what’s known as “indirect grilling”. It’s the grilling method used when you want to cook something that needs lower temperatures and a longer grilling time, or what we call “low and slow”. To learn more about indirect grilling click here and here. If you’re used to cooking on a grill with three or more burners, and indirect grilling was a method you used a lot, you might ask the question “Is indirect grilling even possible on a 2 burner model?” The answer is yes, and it’s actually pretty simple. 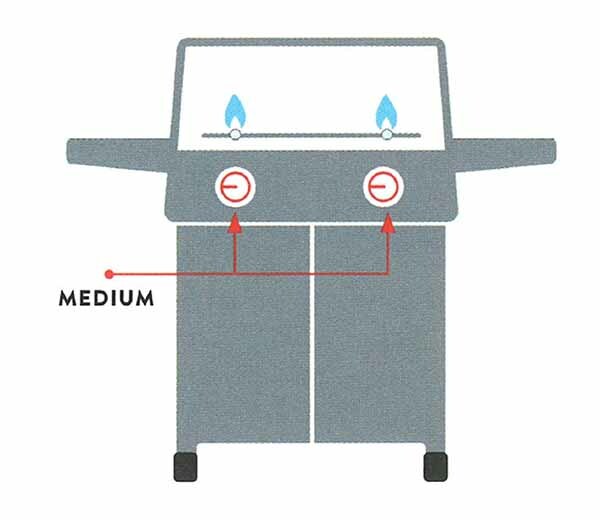 The image above shows how you’d setup a 3 burner model to grill indirectly. The outer burners are turned to medium (or low) and the middle burner is turned off. In this image, a 2 burner model is shown, and the basic principle remains the same. Set the outer burners to medium (or low), but in this case there is no middle burner to turn off. 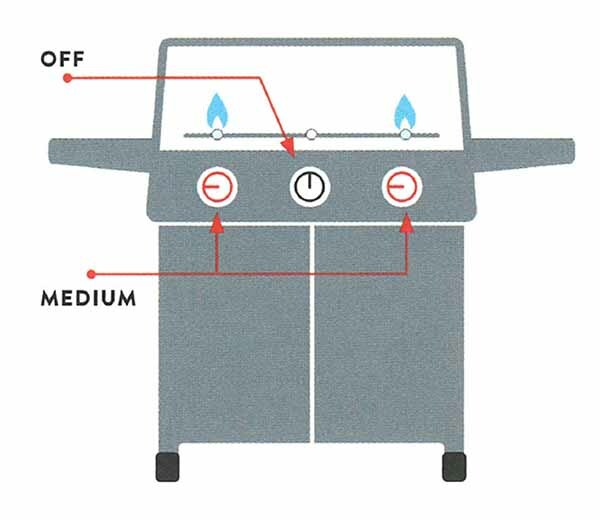 To grill using the indirect method on a 2 burner model, it helps to understand how the burner tubes are positioned in the grill. 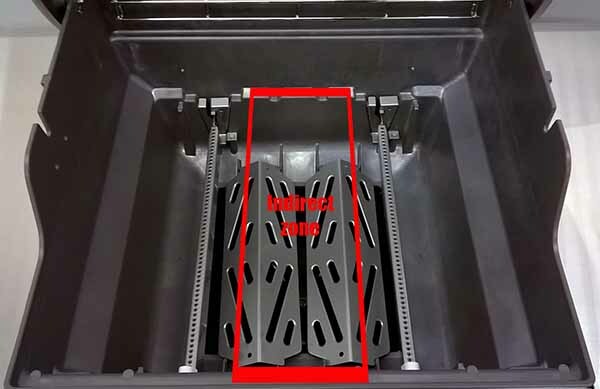 With the cooking grates and Flavorizer Bars removed, we can see that there’s a rather large space between the two burners and this is the best area for indirect grilling. The highlighted area shows where you’d want to position your food for indirect grilling. With the grates and Flavorizer Bars back in place, it’s easy to visualize where you’d have the food positioned. But let’s say you’ve got something really large you want to grill, like a turkey, and that indirect zone is a bit too narrow. What do you do then? The answer to that is pretty simple as well. Instead of having your food positioned in the middle of the grill, you’d want to turn off the right burner and use that area as your indirect zone, and you’d want to set the left burner to medium or low, depending on what you’re grilling. If it’s something really large, you may need to rotate the food halfway through the grilling process to make sure it cooks evenly. 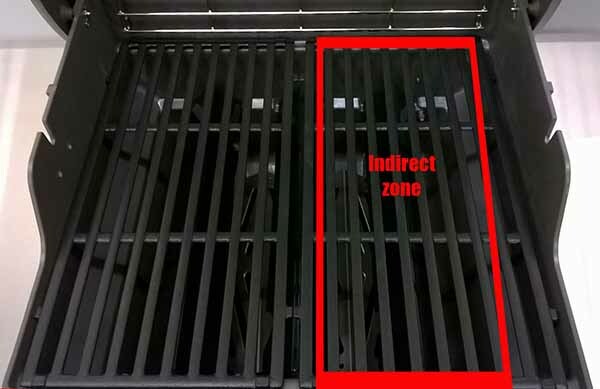 If you’re big into indirect grilling, you may want to rotate your cooking grates and Flavorizer bars periodically to help them wear evenly, as opposed to having only one side of the grill seeing all the action. By using these tips you should be able to grill anything from ribs, prime rib roasts, pork shoulders, to whole chickens and turkeys! Check out Spirit II E-210 here.